Gall caused by the presence inside of minute larva of a gall wasp (f. Cynipidae, possibly Heteroecus. Observed in the Wickenburg Mts., Yavapai Co., Arizona, USA. Dec 2010. 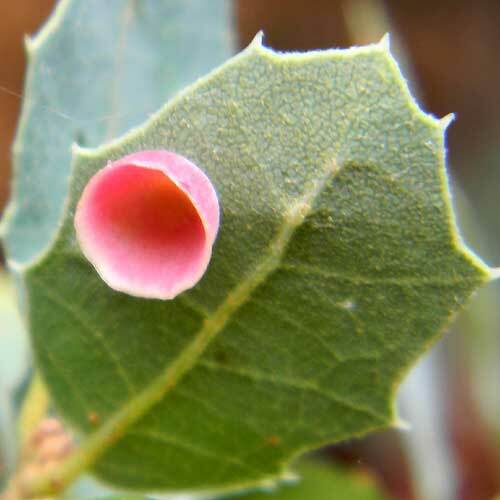 Cup-shaped gall caused by the presence inside of a minute larva of a gall wasp (f. Cynipidae). Observed at Seven Spring, Maricopa Co., Arizona, USA. Aug 2010. All of these galls began when the new tissue (leaf, stem, fruit, etc.) was just emerging from the bud. A tiny black wasp barely 3mm in length, called a cynipid, inserted an egg, into the tender new growth. Along with the egg was a concoction of plant growth regular chemicals. These chemicals mimic the plant's own growth hormones, but delivered in the wrong place at the wrong time. The egg hatches into an even smaller grub, a worm-like larva that feeds on the misshapen plant growth and releases yet more growth regulators. Thus the galls are plant material that has been hijacked. 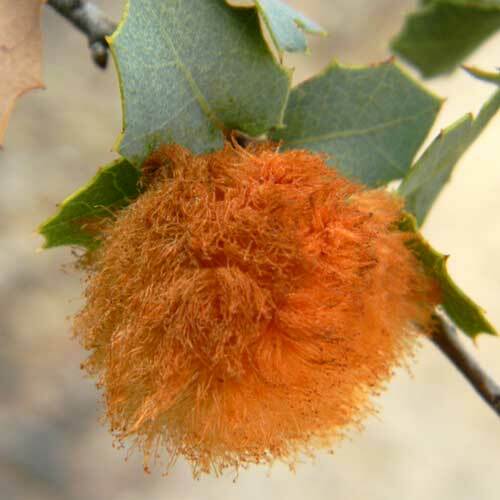 Read more about Gall Wasps at Wikipedia. 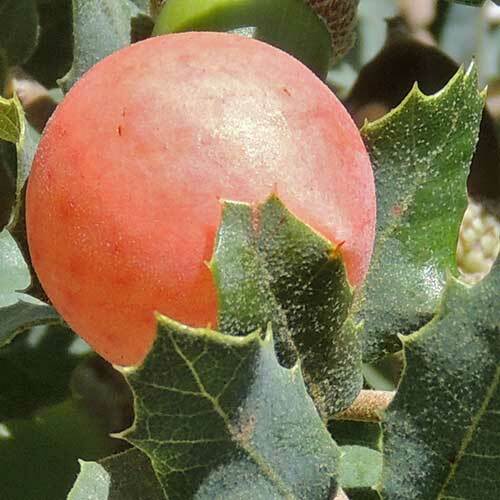 This example is of the type often called an "Oak Apple Gall" because of the resemblance to a fruit oddly attached directly to a leaf. Upper Sycamore Creek, Mazatzal Mts., Maricopa Co., Arizona, USA. 31 Aug 2013. 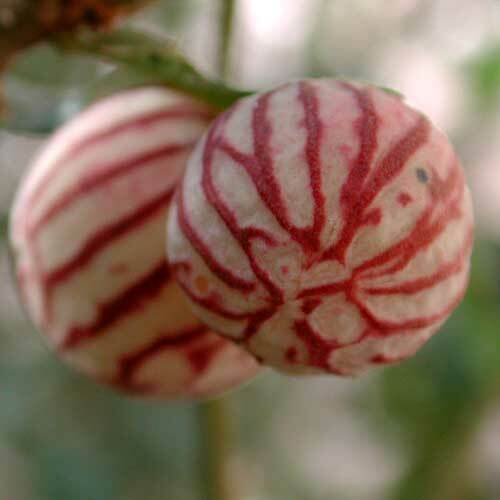 At the center of the gall is a small spherical chamber where the wasp larva developed. It has since emerged and made its exit from the gall through the similar-sized hole in the wall seen at left. 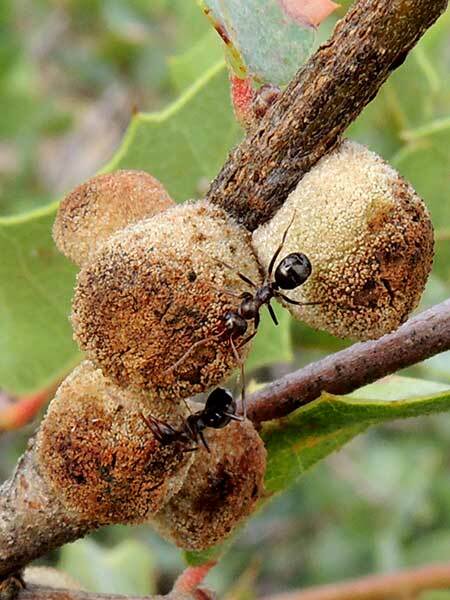 The logic of these structures revolves largely on defenses against parasites of the gall wasp larva. A parasitoid would have difficulty in reaching the larval chamber from the outside of the gall. Upper Sycamore Creek, Mazatzal Mts., Maricopa Co., Arizona, USA. 31 Mar 2018. Upper Sycamore Creek, Mazatzal Mts., Maricopa Co., Arizona, USA. 31 Aug 2013. 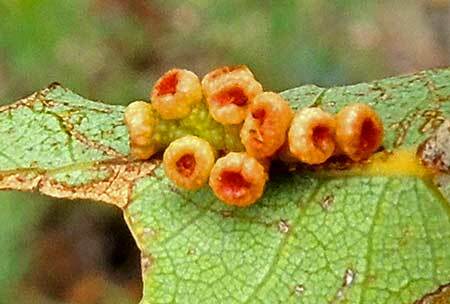 Galls caused by the presence inside of a minute larvae of a gall wasp (f. Cynipidae). Observed at Seven Spring, Maricopa Co., Arizona, USA. Aug 2010. 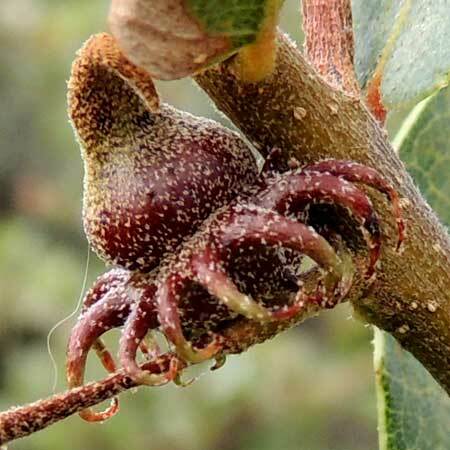 A great variety of galls can be found on the leaves, petioles and twigs of oaks and Scrub Live Oak is no exception. These structures are produced by the plant in response to the internal feeding and chemical secretions of minute insect larvae. The larvae are immature wasps, having arrived there when an adult female wasp (barely 2 mm long herself) inserted eggs into newly flushed leaves. Many are brightly colored and have received a lot of attention from ecologists and entomologists. Identifying the many kinds is made even more difficult due to the same species of wasp producing very divergent qalls through the season and on different locations on the leaves, stems or buds. The stories told are quite fascinating and could easily fill a heavy tome. 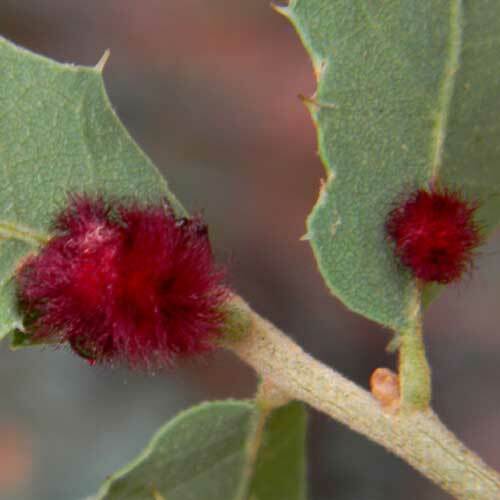 Galls caused by the presence inside of minute larvae of a gall wasp (f. Cynipidae). Observed in Peralta Canyon, Superstition Mountains, Pinal Co., Arizona, USA. October 2005. 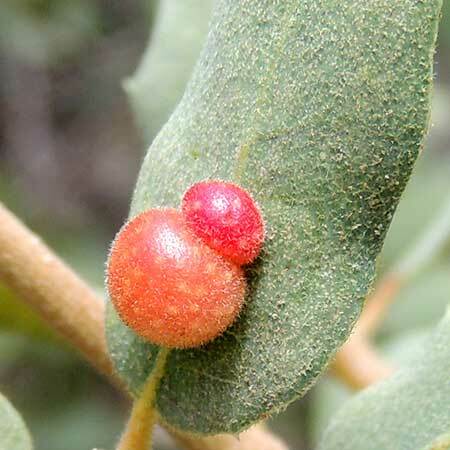 These stem galls located on current year stems have a spongy surface that produces sugary substances attractive to ants, thus called honey dew gall wasp. Wood ants, Formica, are among those that take advantage while at the same time offer some protection to the gall insect and the oak. Upper Sycamore Creek, Mazatzal Mts., Maricopa Co., Arizona, USA. 31 Aug 2013. These urn-shaped galls located on the mid-vein of a leaf. Upper Sycamore Creek, Mazatzal Mts., Maricopa Co., Arizona, USA. 31 Aug 2013. 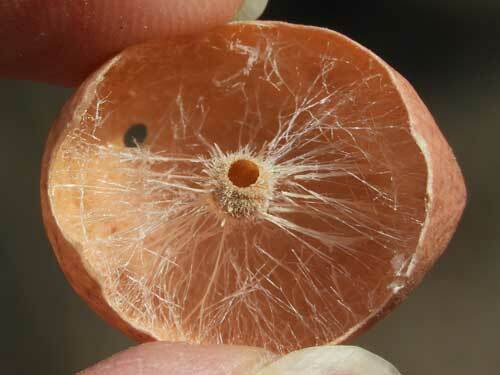 This gall formed from an acorn bud after a cynipid wasp deposited egg inside it. The acorn cup now looks like a jesters cap. Upper Sycamore Creek, Mazatzal Mts., Maricopa Co., Arizona, USA. 31 Aug 2013.